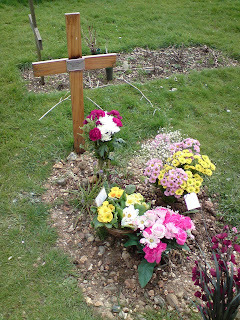 Jon and I went to visit Chris yesterday, can't believe it is almost a year since he passed away. The weather kindly gave us a gap in the rain. 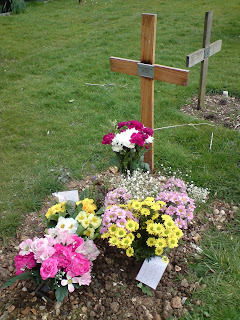 We laid some flowers and each said a silent prayer. Mick was also going to join us, but unfortunately a solid M25 forced him to turn round and head for home. Max joined us for a while, he lives near the cemetery so visits every week to tend the grave (its good to know he is keeping an eye on him). He's says there are always new flowers on the grave so he's not the only one visiting... and I'm sure come Friday the grave will be a wash of colour with other flowers and messages.